Do Well-Adjusted Cats Sometimes Get Into Fights? 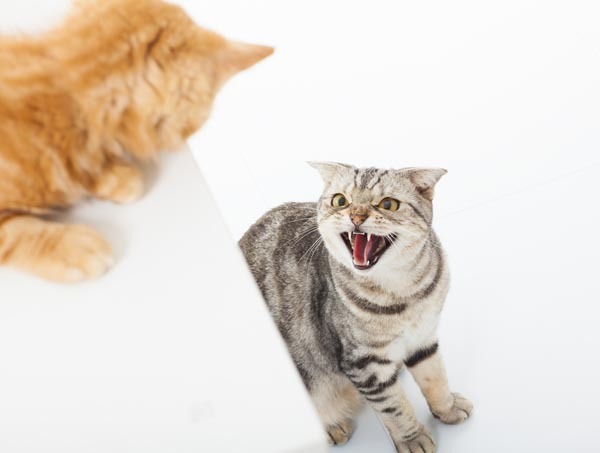 Cats won't fight without good reason; here are some root causes that can lead to aggression. Cat fights are awful, especially when the cats at war are yours. The cats may have a history of skirmishes, or it may be a heartbreaking first-time event. The causes of inter-cat aggression vary as much as the intensity of the brawls. At times the violence is surprising — cats who’ve sweetly spent their whole lives together suddenly are sworn enemies. Other times the behavior is almost expected, the cats have a long history of violence. Two cats starting to fight. by Shutterstock. 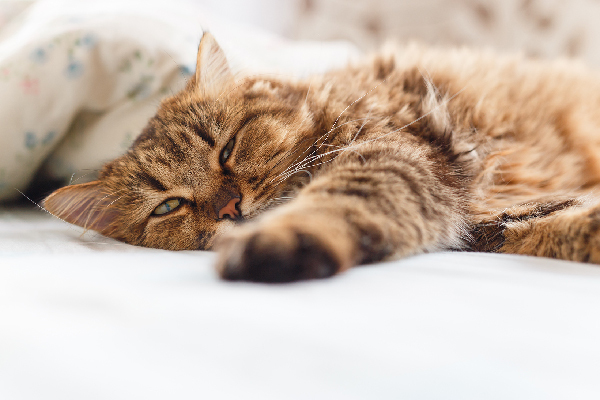 Animals are not on their best behavior when they don’t feel good — cats included. They sometimes show their pain and discomfort by lashing out at nearby animals or by being cranky. 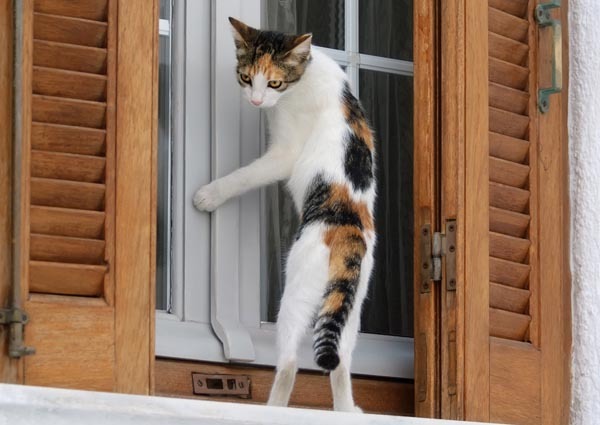 Often, the unlucky recipients are other resident cats. 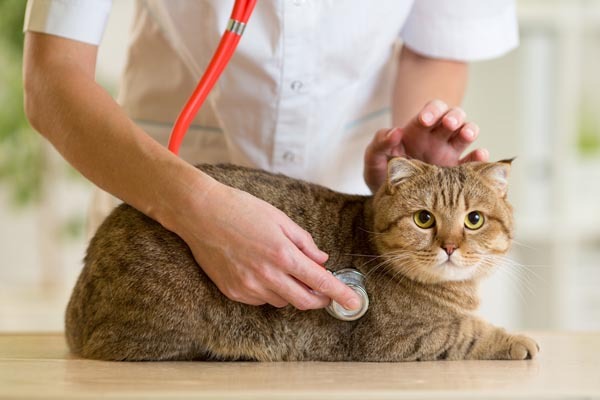 Toothaches, arthritis, and urinary tract infections along with other painful medical conditions can transform a normally mellow kitty into one who is combative. Chronic pain can also cause chronic irritability. Feeling poorly affects moods, no matter the species. Cats who are acting out with unexplained aggressiveness should be thoroughly examined by veterinarians. Also, be mindful of sensitivities. Cats will cry, bite, or shy away when sensitive areas are touched. Aggression can indicate there’s a medical problem. by Shutterstock. Redirected aggression is serious and makes best friends into sworn enemies. 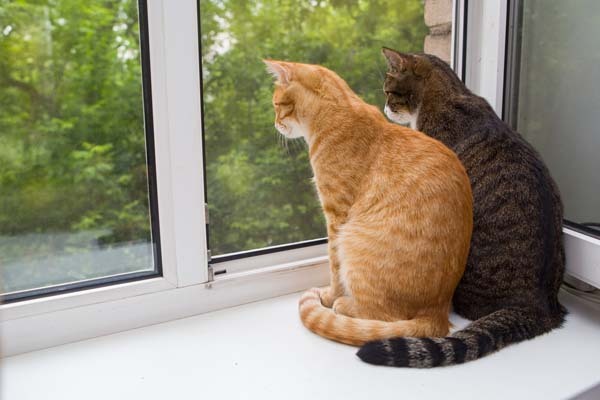 This is usually caused by neighborhood animals who the resident cats can see but cannot reach. The agitated kitties, unable to access the outsiders, vent their frustrations on whoever is closest. Many times, the recipient is a cat whom they are bonded too. Take redirected aggression seriously, and immediately separate the cats from each other without getting scratched or bitten. Place the aggressor in a darkened room with food, water, litter box, and a place to sleep. 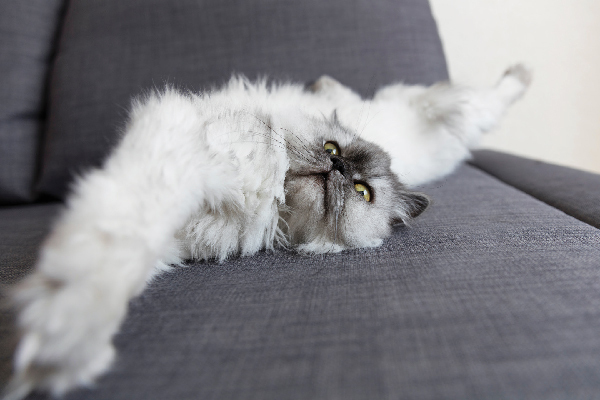 It can take a day, sometimes longer for cats to calm down. In severe cases, cats have to be gradually reintroduced to each other. Sometimes cats don’t receive warm welcomes from the other resident kitties after visiting veterinarians. Instead of nose touches and head butts, their housemates greet them with hostility. Although heartbreaking, it is understandable. Cats are very smell-oriented. Their sense of smell helps them recognize family and friends as well as identify potential threats. It also helps them orient themselves in their environments. Vet clinics are scary places, complete with unfamiliar and unpleasant odors. Medications, antiseptics, and other odors cling to fur, making felines smell alien. When these kitties come back home from the clinics, the other resident kitties don’t recognize them. They may look familiar, but they smell weird. You can stop this aggression before it begins. 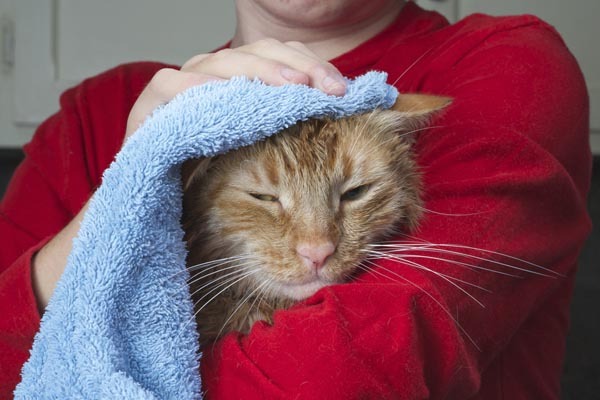 Before taking your kitty to the clinic, gently massage her with a soft towel so that it picks up her scent. Place the towel in a sealed plastic bag. When you come back from the veterinarian, remove the towel from the bag and pet her with it, so that she smells familiar to the residents. If you forget, then transfer your smell onto her as soon as you are home by petting her with an item of clothing you are wearing that has your scent on it. Transfer the cat’s smell back on her after she comes home from the vet. by Shutterstock. Cats are territorial and generally don’t immediately feel warm and fuzzy about other felines moving in. 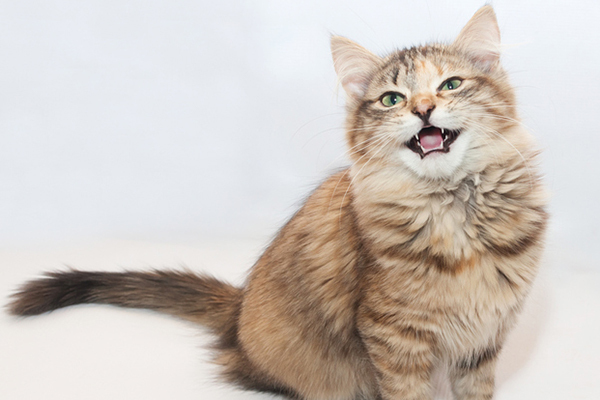 Although bringing home a new buddy for your kitty can be a good idea, introducing them too quickly isn’t. Of course there are exceptions, but as a general rule, poorly done introductions usually lead to violence. In addition to reducing the stress and minimizing the fighting, gradual introductions can encourage cats to become friends. Start by keeping the cats separated from each other. They need their own sanctuary rooms, places they can feel secure. Introductions are done in phases, first by introducing scent, than using food as a tool for peace. Adjust your own sense of time — successful and stress free introductions can take months. Two cat friends. by Shutterstock. Peaceful households change into war zones when cats bicker over their places in the hierarchy. Positions aren’t static — placement is not assured. Cats take turns, their positions shift, depending on many factors including other cats, illness, and changes in the household. Squabbling isn’t unusual when one or more of the cats is between the 8 months and a couple of years old. They are at a crucial age — teenagers trying to figure out where they fit in. The dynamics are also changed when a cat dies or is rehomed. The loss opens up a place that needs to be filled. It is easy to see who’s who in the hierarchy. Cats show their status by where they sit in relationship to others. 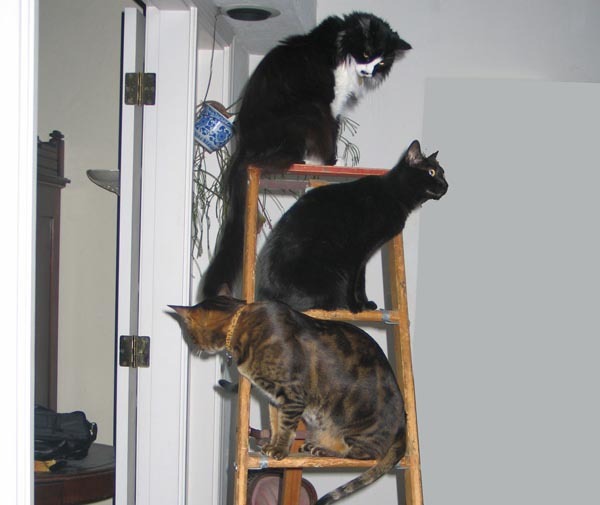 Those who occupy a high position on the social ladder hang out in the highest spots. You’ll find these high achievers on the top shelves of cat condos or up high on book shelves. You can also spot them monopolizing favorite spots warmed by the sun. You can help restore peace by increasing the vertical territory. Buy or make cat trees and install shelves. Book shelves, armoires and other household furniture can do double time as vertical territory. Additionally, increasing the number of scratching posts and horizontal scratchers will help ease tensions because cats mark their territory by scratching. Cats have flexible hierarchies. by Marilyn Krieger. Watch out when the hormones are in control. Whole, sexually mature males will fight to defend their territories and become particularly fractious when there are receptive queens (unspayed females) nearby. Queens aren’t exempt from violence either. They can become particularly cranky toward other females when they are in heat. They will also defend their newborns against all perceived threats. In addition to helping with population control, spaying and neutering cats reduces inter-cat aggression. It can take six to eight weeks after the procedures until the hormones are out of their systems. 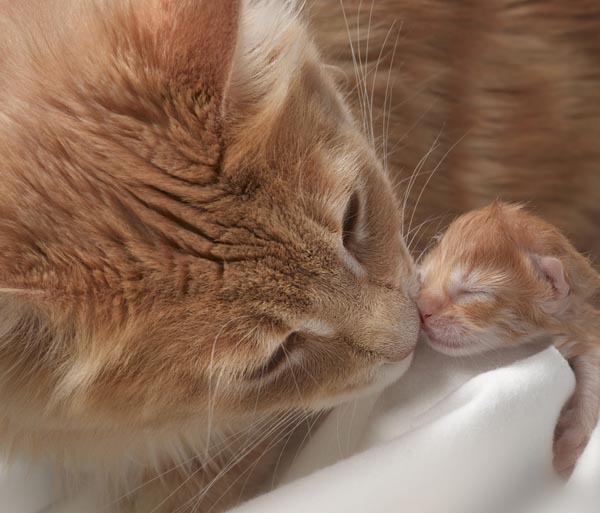 Mother caring for her newborn kitten. by Shutterstock. Differences in age can create havoc. 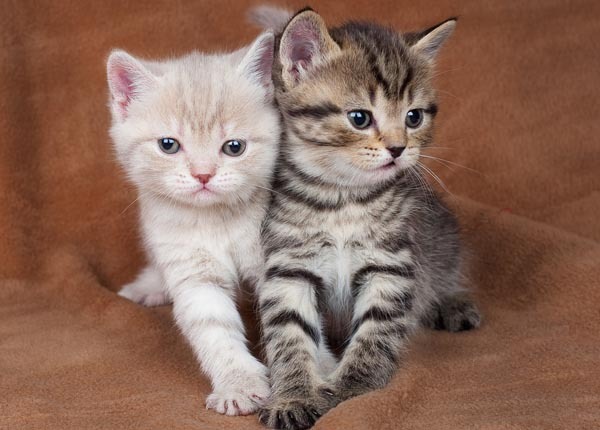 Sometimes kittens are adopted to be companions for older, adult cats. Although people’s intentions are good, it doesn’t always work out as planned. 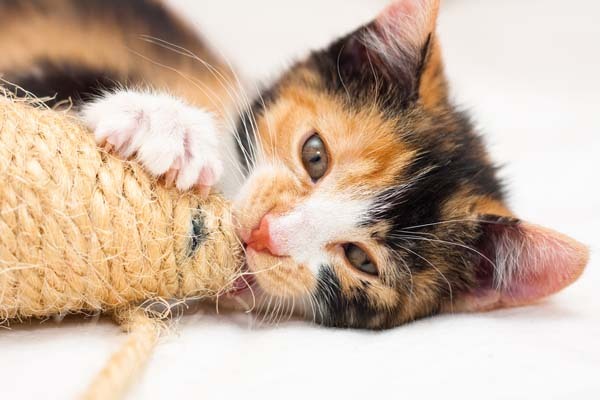 Kittens want buddies they can have intense long play sessions with, while older cats are calmer, preferring quiet naps to high-energy, incessant play. The differences in opinion typically begin when adults, rejecting the youngsters annoying overtures, are ignored. Avoid the problem by adopting compatible cats. New kitties should be around the same age as the resident cat and be about as playful. Also, become familiar with the histories and personalities of the cats. Be on the lookout for kitties who get along well with other felines and have personalities that are compatible with your resident kitty. If you have your heart set on adopting a kitten, adopt two. Most likely, they will keep each other entertained and ignore the oldster. Kittens keep each other company. by Shutterstock. Aggression doesn’t occur in a vacuum — there are always reasons. You can stop many of the battles before they begin by addressing the underlying causes. She is also an award winning author. Her book Naughty No More! focuses on solving cat behavior problems through clicker training and other positive reinforcement methods. Marilyn is big on education — she feels it is important for cat parents to know the reasons behind their cat’s behaviors. She is a frequent guest on television and radio, answering cat behavior questions and helping people understand their cats. I have 2 females cats that are sisters. I’ve had them since they were kittens and are now 6 years old The last couple of years one of them has decided she don’t like her sister anymore by hissing at her and stopped cuddling with her. Lately they all out fight. I took the aggressor to the vet and they found nothing wrong with her. Said it was behavioral. What do I do? We built a catio this year. At first, it was wonderful and everyone was loving it. But cats from the neighborhood starting coming around and peeing, since then Nikita (female tabby and alpha cat of the household) has been acting up and is aggressive toward Jazzy (female tuxedo, a rescue). a lot of hussing and pursuing. I tried to give the agressor cat more attention, but that doesnt seem to be helping. We have cats a male and a female cat. But are fixed both around same age. Most of time they get along bigger sometimes they fight. When they fight out gets out of control. What do I do to stop the fight? The weirdest thing – my boys are rescue and have been living together in peace for 10 years. On Friday I came home to chaos and clearly an all out fight! I calmed them down and everyone slept together on the bed. The following morning I saw a cat on the patio and one of my boys went crazy and I was able to get the other one out of harms way. Later on in teh day another all our brawl so I covered the patio windows thinking it was the outside cat causing all the drama. Again later in the day, another fight. One is afraid to go downstairs, he is the less dominant and the other, the alpha seems afraid. All slept together last night again and this morning super tentative – I washed the patio and the windows in case the cat sprayed, I have sprayed my house with Felineway but this morning after eating together and after my less dominant boy used the litter, the other one smelled his bum and they both starting hissing again. What is happening – the howling and screaming of the fights is horrible and I am worried they will really hurt each other. I have now place the more dominate cat in a separate room. Please help! I’m experiencing the same thing now with my two neutered boys and I’m doing much the same things as you. Did your situation ever resolve? How long did it take? At the moment my guys are tense (hissing and yowling) only occasionally (and I don’t really know what the triggers are) but like you I am afraid for them. Especially the submissive boy. This describes the situation with my 2 exactly ! Its so awful to watch 2 boys who were good buddies,the young one wants to constantly attack the older one,who is constantly petrified ! Im at my wits end !